You can generate this directory from anywhere you find the blue Toolbar. So, this can be run for an organization, a Tag, a Search Builder results, or filtered list in an organization. However, the recommended place to generate this is in Search Builder. See caution below. 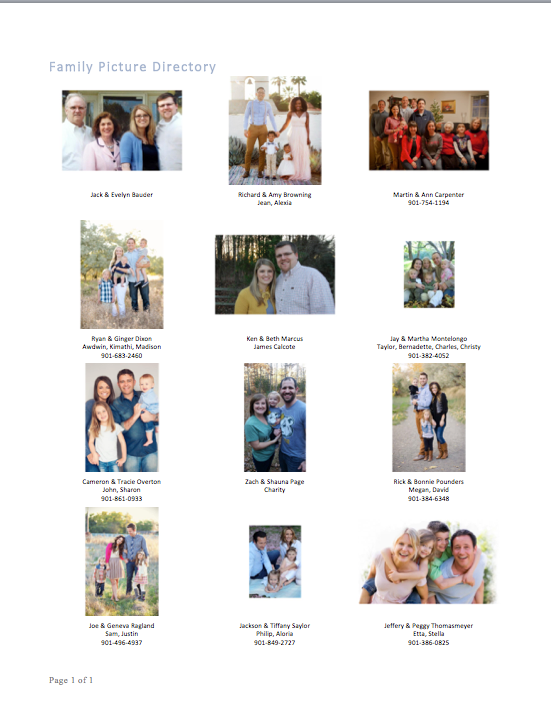 This directory uses the Family Photo, not individual ones. There will be 12 family photos per page. If there is no family picture, the family information will still print in the directory. The first and last names of the Primary Adults will display (unless the family has a FamilyName Extra Value - see tip below) followed by the first names of the children. If children have different last names from the HOH, both their first and last names will display. The Home Phone number will display beneath the names of the family members. We recommend that you generate this from Search Builder, and that you add the Condition Is Head of Household. With that condition, it will generate one picture per family, instead of one for each person in the list. The directory will list all immediate family members under the photo, except Secondary Adults. So, if you run this from an organization that has couples in it the directory will display twice - once for each spouse. If you plan to email the file to those in the directory, you may want to save it as a PDF file, then everyone can open those types of documents. If you want to print the directory, see instructions below. Go to the target group of people you want included in the directory. Select the blue Toolbar > Cloud > Directories > Family Picture Directory . This will open in Word. If you want, you can select View > Header and Footer (in Word) and add the header and / or page numbers. You can then save it as a PDF (or Word) and email it or print it. The family name will by default display like this: John and Mary Johnson However, if you would like the name to display differently, you can add a Family Extra Value named FamilyName and enter whatever text you want to display in this directory. Example: Dr. John and Dr. Mary Johnson Family, or Kathy Jones and Ken Smith Family. The Toolbar offers other options for directories and we also have online directories.